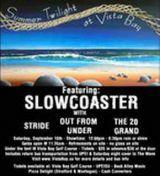 Summer Twilight at Vista Bay is a mini-festival performance during the day on September 15th, under a tent at the Vista Bay Golf Course. This rock show features Slowcoaster with special guests, Out from Under, Stride and The 20 Grand. Tickets are for sale at Vista Bay Golf Course, UPEISU, Back Alley Music, Pizza Delight in Montague and Stratford and Cash Converters. Tickets are $25 in advance/$30 at the door and include return bus transportation from UPEI and free cover to The Wave that night. Gates open @ 11:35am. More Info visit http://www.VistaBay.ca for more details and Bus info.